recommended. A diaphragm sludge pump is best suited for removing the tank contents that should be transported in a watertight, closed container. Trucks are made that specifically pump and carry the waste material to a place where it can be disposed of. Tile fields of lines made of concrete, clay, or PVC are laid in the ground with open joints or perforations to dispose of settled sewage into the ground. A fiber pipe (Orangeburg Alkacid) or plastic pipe with holes bored in the lower portion of the pipe to allow drainage may be used for these drain lines. This pipe is light in weight and is easily laid in the trench. It comes in sizes ranging from 2 inches to 8 inches in diameter and in lengths from 5 feet to 8 feet. Because of these long lengths, this type of pipe is particularly valuable in soil where other types of pipe may settle unevenly. Figure 2-14 shows a typical field layout. Figure 2-14. 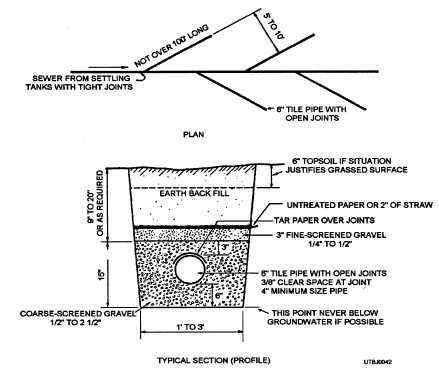 - Typical layout of a subsurface tile system.